Since we are a family owned and operated business, we love celebrating the holidays with our team and their family. The never-ending fast pace of 24/7 emergency response can wear down our technicians, so taking a break to relax and enjoy each other’s company can be a great way to refresh ourselves. 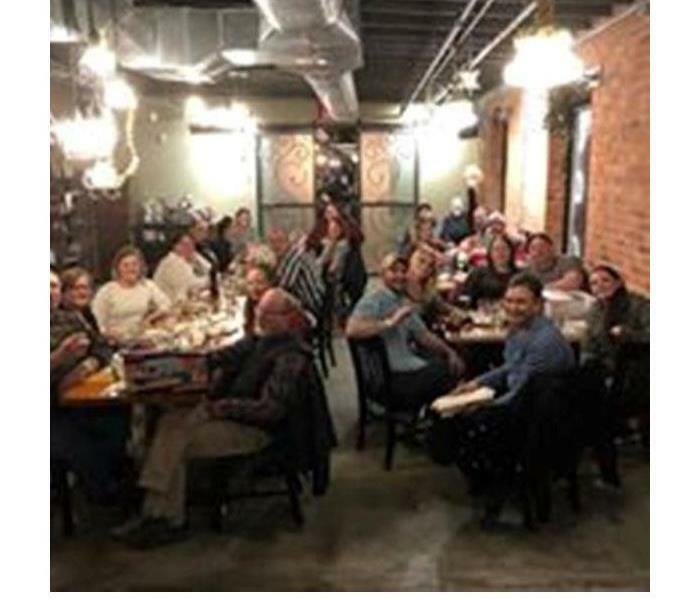 We celebrated with our employees by having a Christmas party at a local restaurant where we enjoyed pizza, appetizers, and dessert. We also did a white elephant gift exchange for fun. As a small business, we are able to get to know our employees and their families. Spending some fun time with them during the holidays makes us a stronger team. If water or fire damage disables the heat in your home, we have resources to help with that. There can be many reasons why there is no heating available. The most common one is water flooding the furnace, making it inoperable. 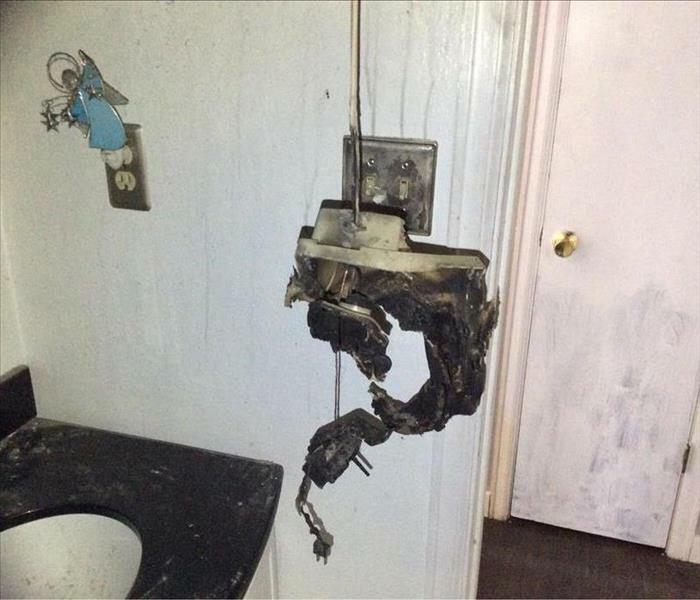 In some cases, fire may damage the wiring in your home, making it unsafe to operate the heating system. One of our best pieces of equipment to heat up your home is the Blaze 100HC furnace. It is a portable, indirect-fired, diesel furnace that we can transport to your home and set up. It has enough power to provide emergency heat to your home until you get your furnace working. It is important to heat the property if it is water-damaged, in order to rapidly dry the structure. In fire damage situations, heating the home can prevent expensive breaks in the plumbing system. Do you have a puppy that likes to help? This particular puppy wanted to help water the plants. Fortunately, taking care of mishaps like this are our specialty. Whether your water damage is caused by your plumbing or your best friend, we can dry it out quickly. That’s Why SERVPRO. We can take care of anything that life throws at you. During a water or fire damage response, a lot is happening at once. The chaos of unexpected damage causes emotion and stress levels to rise. Communication is critical in handling these situations effectively. We explain to our customers the many steps in the process of restoring their home or business, giving them peace of mind that the job will be done properly. We also stay in constant contact with the insurance company, keeping them advised as each step in the process is completed, as well as any challenges that may come up in the restoration process. At SERVPRO of Casper, we pride ourselves on communication. It is the cornerstone of customer satisfaction. A sudden cold snap here in Casper caught many homeowners with sprinkler systems off-guard. 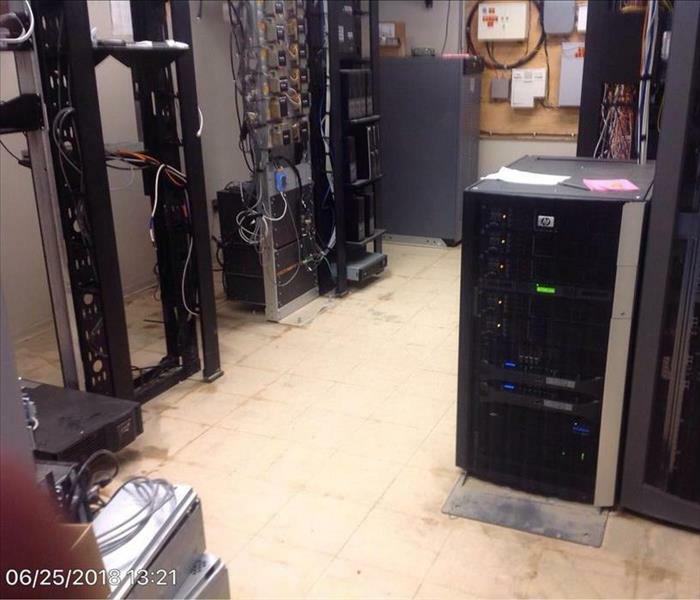 They had not winterized their systems, and freezing and line breakage occurred. In this photo (shown partially through tear-out), you can see how the water saturated the soil, and pushed its way through the exterior concrete wall. Drywall and insulation are being removed so we can dry the sub-structure). 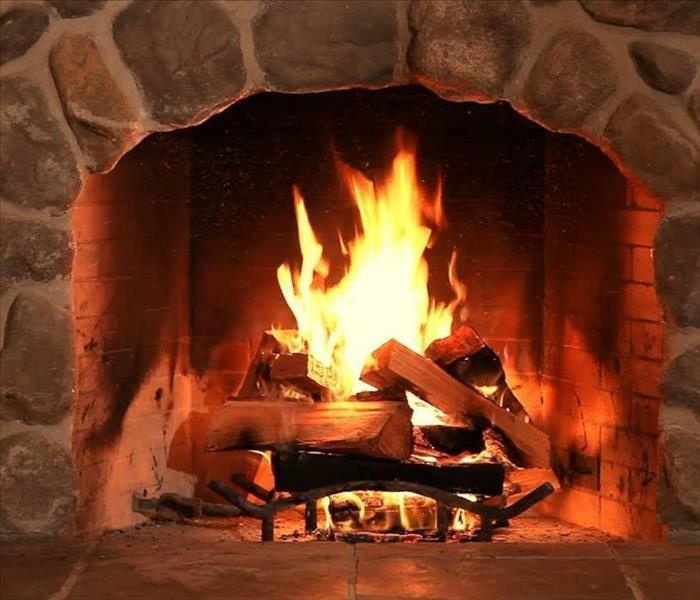 Now that winter weather has arrived, heating systems are being turned on, and fireplaces are being lit. But are they going to work safely and efficiently? It is a good idea to get your ducts cleaned, and your chimney swept, at the beginning of the heating season. Also, don’t forget to open the flue on your fireplace before you start that first fire! It’s important when hiring a company that you make sure that the company, and employees have the proper training to ensure that the job is done to industry standards. We are proud at the fact that we have our employees trained in any aspect of the job we come across. We have employees all the way from office to Owners trained. At SERVPRO of Casper, we take professional education seriously. 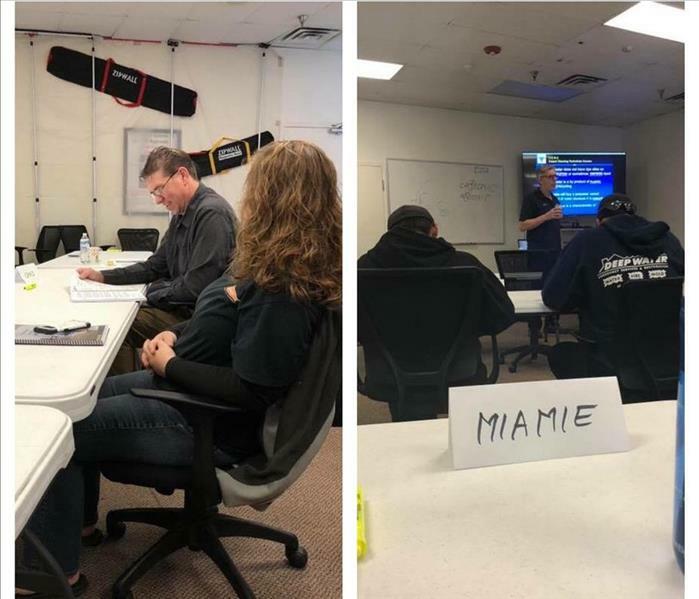 We invest in our employees by sending them to IICRC-certified schools (only available in other states) to ensure they have the latest knowledge available in our industry. 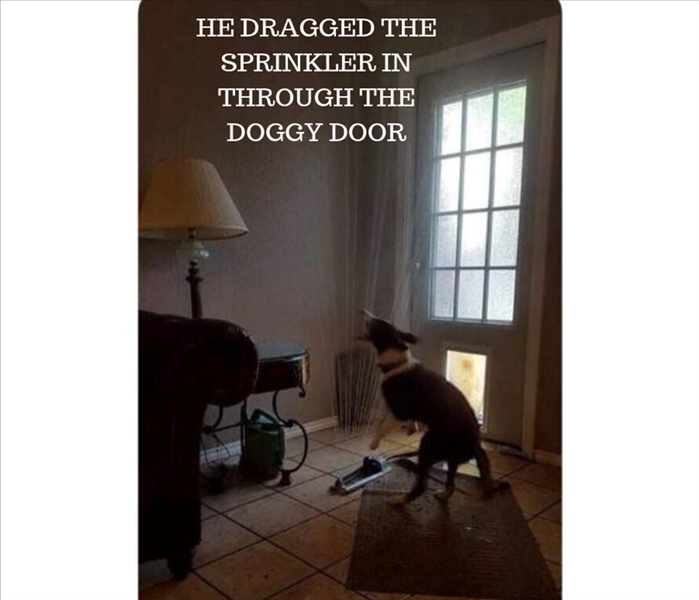 Not only do we send them to be trained and certified in Water and Fire Damage Restoration, but also in Carpet and Upholstery Cleaning. Combine water and dish detergent cleaning solution in a spray bottle. Use a second spray bottle filled with warm, plain water and spray area to rinse. Spray cleaning solution on a small section of brick. Scrub with a nylon bristle brush. Dry with a clean dry cloth. This is a mold damage that happened in Casper, WY. We inspected the structure, and found multiple areas that had suspected microbial growth. 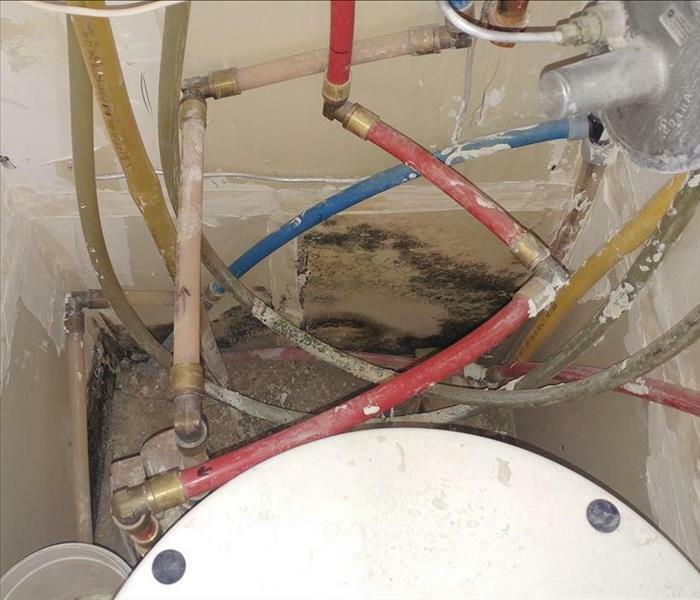 We recommended that they get in touch with an Industrial Hygienist so testing could be performed, and a remediation protocol could be written. The inspection also determined that multiple sources of moisture had caused the microbial growth. Calling SERPVRO of Casper for your mold problems ensures that your home gets back to a healthy condition, and protects the health of yourself and your family. Commercial Water Damage in Casper WY. This loss happened in an apartment complex in Casper. They called in SERVPRO of Casper to perform emergency services, and structural drying. The loss affected 6 floors and multiple apartments. In this picture you can see that we detached the baseboards. Vinyl base cove is common in commercial buildings. They are fairly thick, and prevent evaporation of water. Materials such as this are known as a vapor barrier, and must be removed to facilitate the drying process. 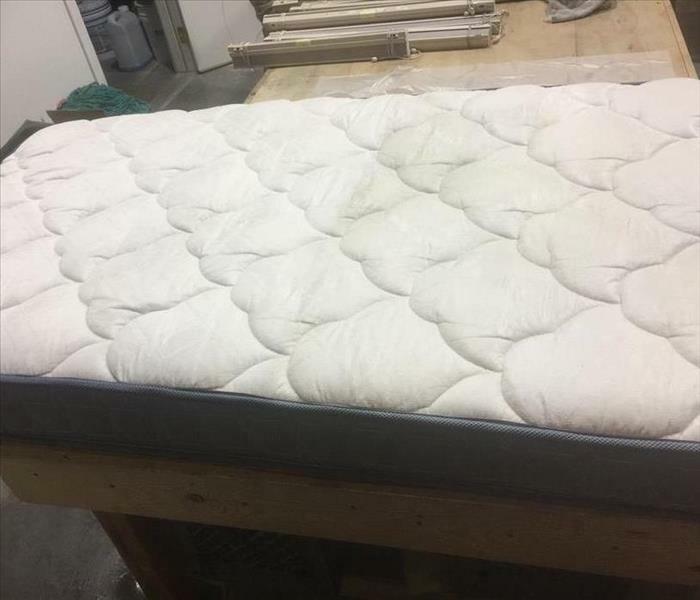 Fortunately, this type of material is relatively inexpensive, so replacement of the base cove does not create much of a financial burden in the restoration process. A recent series of storms in Casper resulted in substantial rainfall that over-saturated the ground. When the ground gets overloaded with water, it often relieves its hydrostatic pressure by seeping into the basements of homes. There were multiple homes that were affected by this. In this particular house, the water came through the foundation and into the lower level. 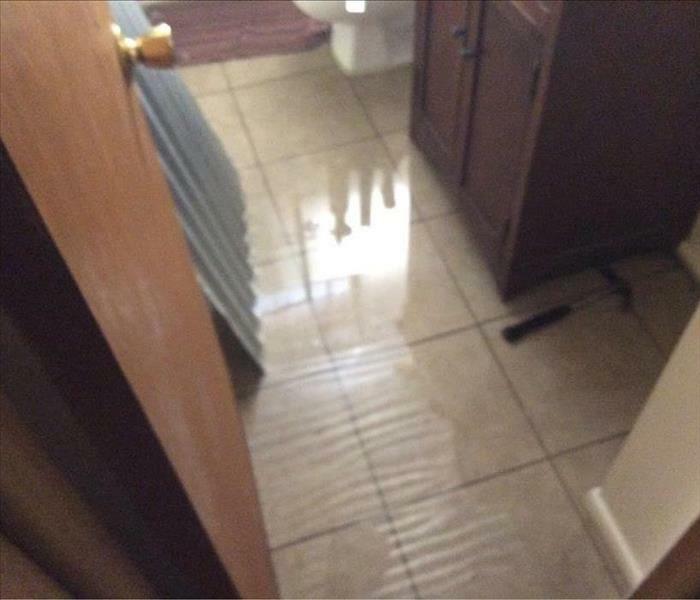 It affected the bathroom, sewing room, living room, and hall; the customer had 1-2 inches of standing water. SERVPRO of Casper knows how to handle storm related incidents, so if you experience this problem or know someone who has, help is only a phone call away. Mother Nature doesn’t take a day off, and neither do we. We have technicians available 24/7, 365 days a year. Water Extraction at a Commercial Building. When performing emergency services on commercial water damages, the initial water removal can often be done more quickly than on a residential site. Flooring areas are typically more wide-open than you would find in a home. Commercial-grade olefin carpet is the most common type of carpet, and is directly glued to the floor without padding. Water removal is very efficient on glue-down commercial carpeting, and it dries much faster than typical residential cut-pile carpets. A small town in Wyoming had flooded and affected many properties. This one in particular business got hit pretty hard, lots of water and mud throughout 3 of their buildings. This picture I thought was particularly important, and this because of all the servers. It is really important to make sure that a professional company comes in and at least cleans and dry’s this room. With all the moisture there is humidity and with this important equipment you can’t afford the humidity ruining your equipment. We place low amp air movers and a dehumidifier to pull out the humidity out of the air. By having SERVPRO of Casper come in its saving you time and money. A school here in Natrona County had some water damage. It had affected a couple of class rooms. We extracted the carpet, pulled some baseboards and placed air equipment. With commercial properties, it is important to respond promptly, and get it dried out as quickly as possible. This can prevent further problems down the road. Over Memorial Day weekend the owner of this home had left town to go camping. On Monday afternoon, they came home and found 3-5 inches of standing water in their basement. They had a broken pipe, and it affected the whole basement. When we arrived, we extracted all the water, moved the furniture in the affected area, and placed drying equipment. We did have to remove some walls because of over saturation, so we could effectively dry the substructure. You can see the standing water in this photo from the reflection of items, and the ripples in the water. Recently, there was a “micro burst” thunderstorm event in Casper. It rained 2-3 inches in a very short period of time. Because central Wyoming gets very little annual precipitation, our drainage systems are not built to handle short, intense storms with heavy rainfall. When these storms happen, they can flood our streets, underpasses, and even homes and businesses. This photo is looking out the back door of a home in Casper. 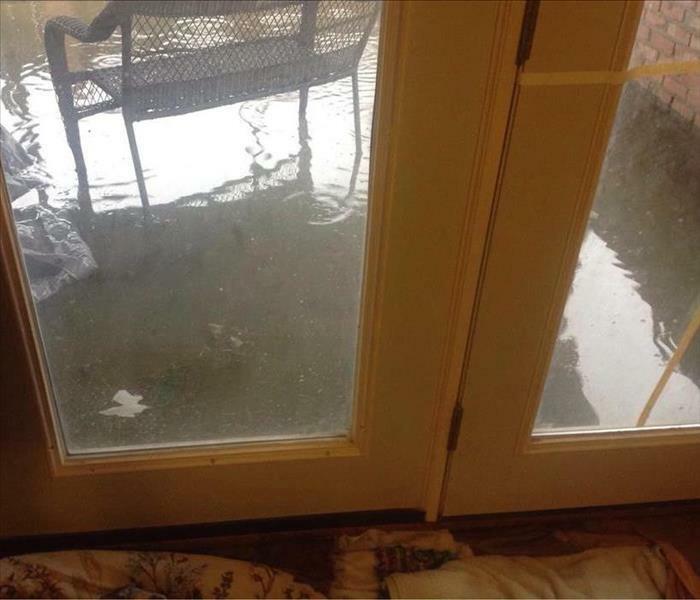 The rainwater drained into the back porch area, filling it up, and causing water damage in the home. This is a frost-free faucet break in Glenrock WY. They had a particularly cold winter, and temperatures dipped below zero degrees several times during the season. When spring time came, they turned on the faucet to water their lawn. Because the break occurred in the pipe forward of the valve, water began to leak in a hidden area inside the wall, and worked its way out to several rooms in the basement. When a fire happens, smoke can move and behave in bizarre ways. There was a fire in an apartment complex here in Casper, Wyoming. The fire started on the floor below this apartment. The fire created high air pressure, and pushed smoke through the plumbing. On the left side of the toilet in this photo, you can see a black “flare” mark. The smoke forced its way from under the toilet, into the rest of the bathroom. When working on a mold job, there are many important steps to take to make sure the problem is properly addressed. A key first step is establishing containment of the affected area. Mold spores are very light, and can easily float around your home, contaminating other areas. Establishing a solid containment with negative air pressure prevents mold spores and mycotoxins from migrating from the affected area to unaffected areas. 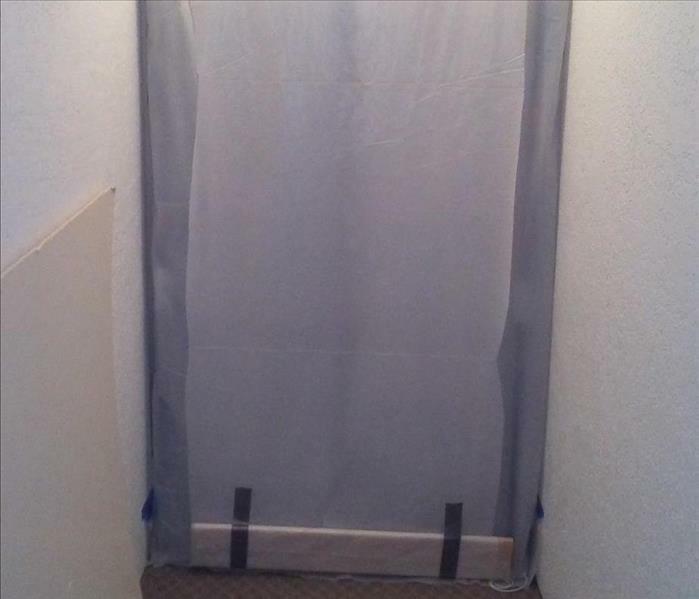 We use spring tension posts, heavy duty plastic sheeting, and tape to create most containment walls and doors. In the example in this photo, we have added a piece of wood at the bottom of the containment door. This helps keep the bottom of the door in contact with the floor, so we can maintain a good seal on the containment. Precautions such as containment and negative air pressure keeps the mold from spreading, and limits the amount of work that is necessary to remediate the mold damage. This piece of equipment is called the Firebird Compact 20. 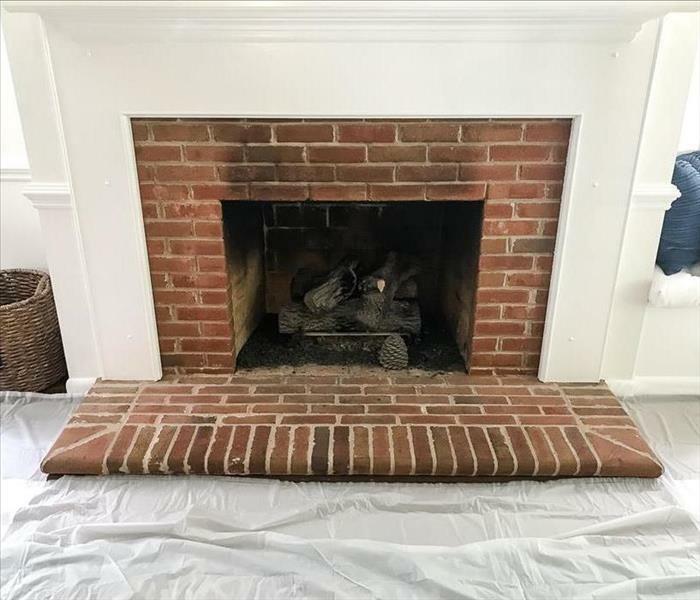 It creates heat to help dry parts of structures that have deeply-bound water and are difficult to dry, such as tile floors. During the recent freeze we had in Casper, pipes were bursting in many homes, affecting a variety of materials. By using the Firebird heater, we are able to speed up the drying process and help save materials. Bathroom fire in Casper Wy. The source of this smoke damage was an exhaust fan in the bathroom. The fan overheated and caught on fire. Most of the heavy smoke damage was limited to the bathroom. The rest of the house had light smoke, and was able to be restored with proper cleaning products and techniques. With this type of cleaning, we can keep on the contents on-site and clean them there. We also used an air scrubber with a HEPA filter to help remove any smoke particles in the air. 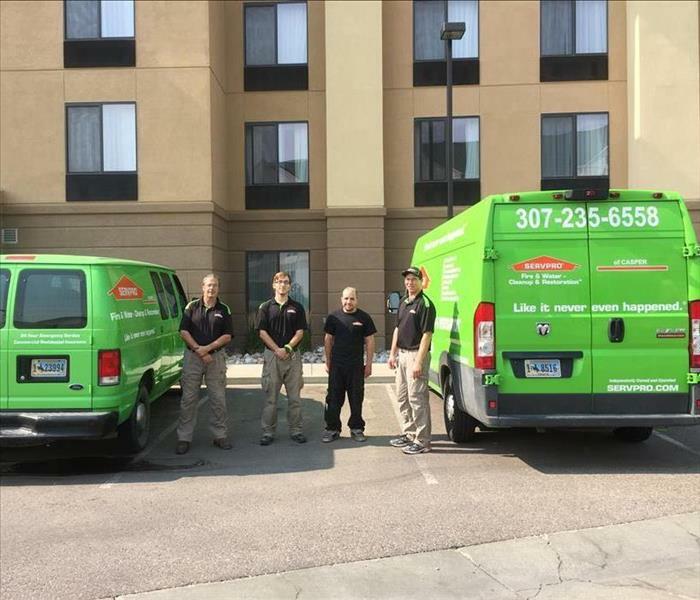 In this picture, our team was hired to clean carpets at a hotel in Casper, WY. With carpet cleaning, people usually think first of the carpets in their own home. But proper maintenance of carpets and flooring in your business is just as important. Clean, vibrant-looking carpets and tile floors make your business more appealing, and helps keep customers coming in. 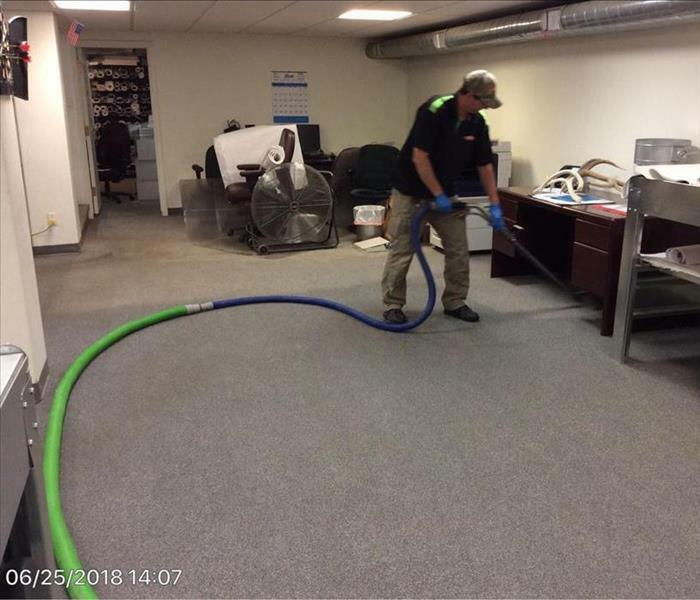 Commercial carpet cleaning also makes your carpets last longer, by removing abrasive soils that could cause premature wear. It is definitely more cost-effective to have your carpets and flooring professionally-cleaned than it is to replace them frequently. From carpeting to vinyl to ceramic tile floors, we provide services to maintain most floors. For more information, call the professionals at SERVPRO of Casper, at 307-235-6558. 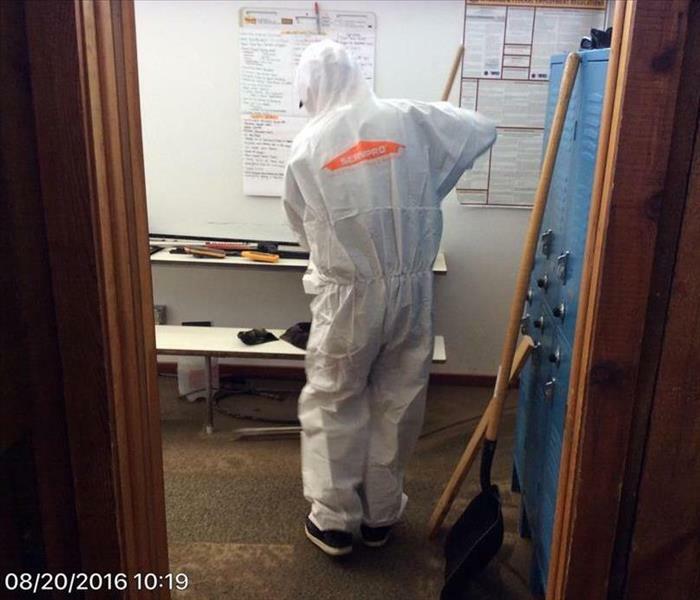 A technician is remediating mold damage in a crawl space at a church in Douglas, WY. There are many reasons that mold could occur in a crawl space. 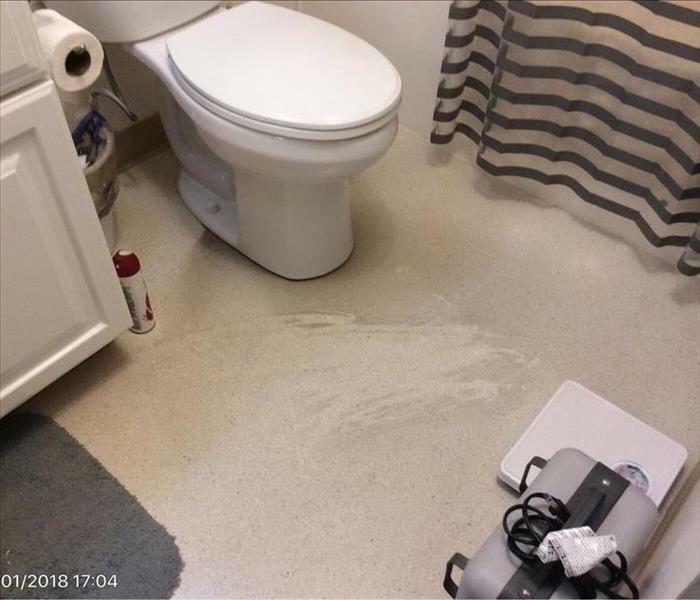 If there was water damage on the main floor, and water seeped through the floor and wasn’t properly dried, the wet structure could begin to grow mold. Also, humidity caused by damp earth can condense on building materials in a crawl space, which can soak into the wood, bringing the moisture content of the lumber to an unsafe level. 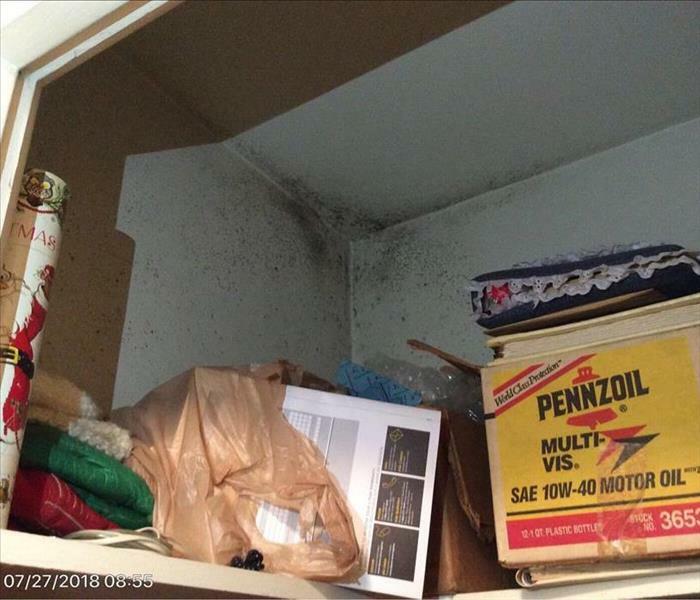 If conditions such as these are not addressed properly, it could lead to mold growth. If you develop mold in the crawlspace of your home or business, SERVPRO of Casper can properly remediate the problem. 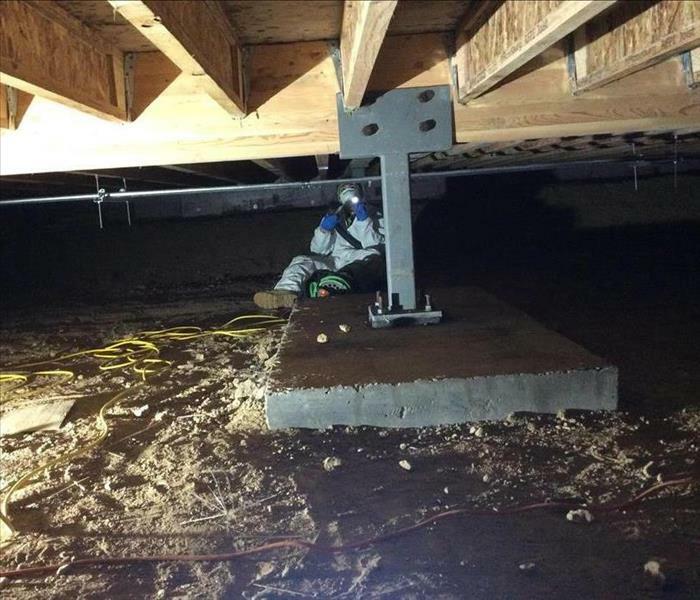 Our technicians can bring your crawlspace back to a safe state. Call us anytime at 307-235-6558 for a free consultation. 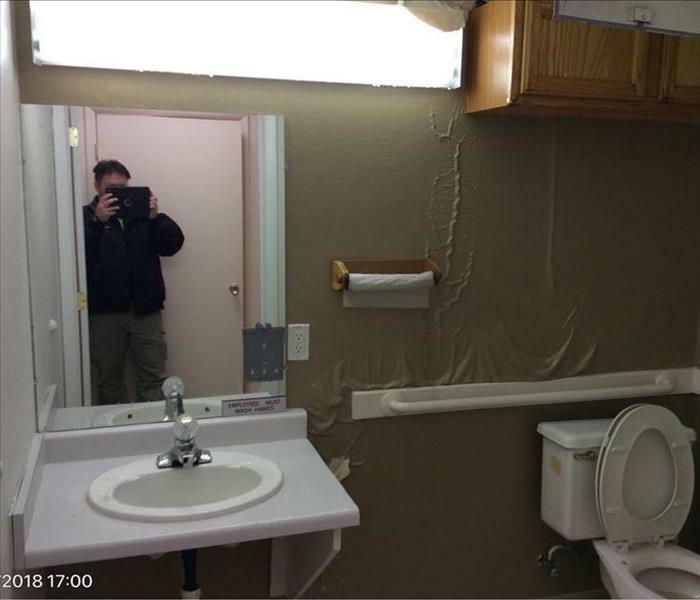 One of our certified technicians is documenting water damage in a commercial restroom. A water heater tank ruptured inside the ceiling of a commercial plaza in Casper Wyoming. The water affected two separate business suites. The walls, floor, and contents were all wet. In this picture, you can see the many layers of paint that have blistered. When the paint is thick on the walls, the water will flow down the wall between the paint and drywall. The paint will hold the water and cause it to bubble up. The water will either remain trapped in the blister, or soak into the drywall. In cases like this, we puncture the bubbles in order to drain the water, then peel back the paint and expose the drywall. This is necessary in order to remove any free water from the damaged areas, and speed the drying of the walls. In this picture, you can see one of our technicians wearing personal protective equipment (PPE). 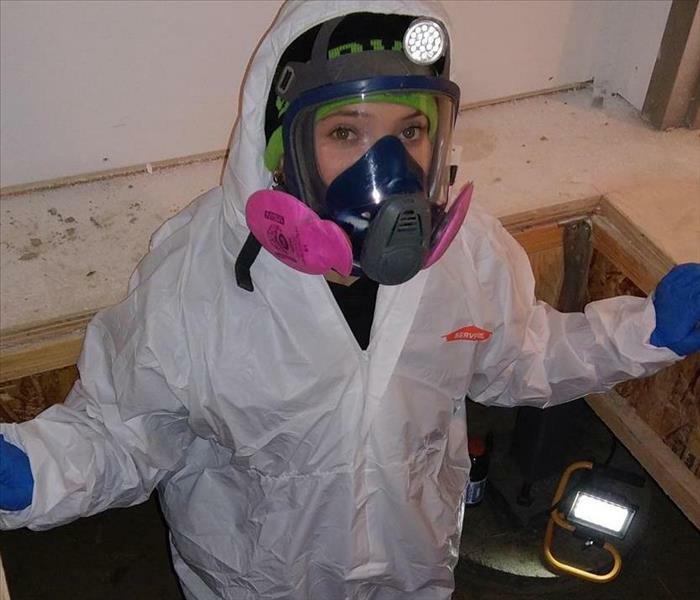 When performing mold remediation, it is very important to wear the appropriate PPE to prevent exposure. It is equally important to contain moldy areas, and moldy materials that are being removed. Mishandling moldy materials can possibly spread mold spores to areas that are unaffected. The technicians at SERVPRO of Casper are trained and experienced in mold removal. They can ensure that mold damage in your home or business is cleaned up safely and properly. This was a fire damage in Casper Wyoming. The source of the fire was a pan of grease on the stove that caught on fire. The homeowner moved the pan to the kitchen sink, and attempted to extinguish it by turning on the faucet. The water caused the fire to flash violently, catching the curtains on fire. The fire was so intense that it burnt most of the kitchen and spread smoke throughout the home. We packed up the contents in the house, and moved them to our facility for cleaning. We also performed cleaning and deodorization in the smoke-damaged portions of the home. After the re-construction was done, we moved the clean contents back into the home. In this picture, we have a large desiccant dehumidifier drying out a commercial building. 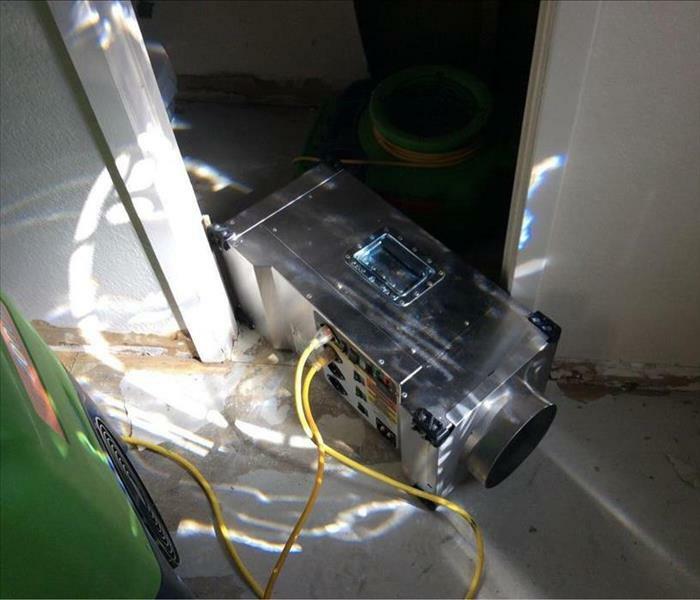 SERVPRO of Casper was contacted when the building’s heating unit failed, causing the pipes to freeze. The entire building had water damage spread over three levels. Commercial desiccant dehumidifiers are capable of producing the driest air of all dehumidifiers. This allows the structure to be dried as quickly as possible. In this picture, you can see the desiccant dehumidifier, and the large generator needed to power it. 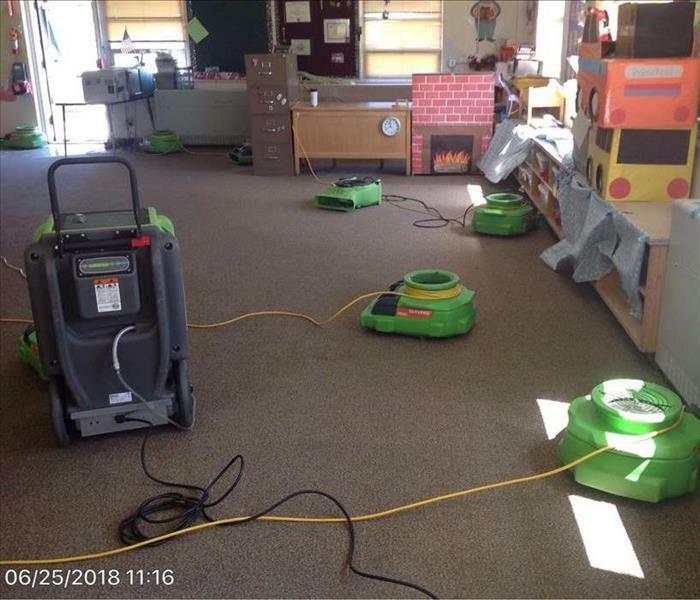 Whether you have water damage in a single room of your home, or throughout a large, multi-level commercial building, SERVPRO of Casper has the tools and experience to get the water out quickly, and get you back into a dry building. This is a parking garage exit at a commercial water loss in Casper, Wyoming. 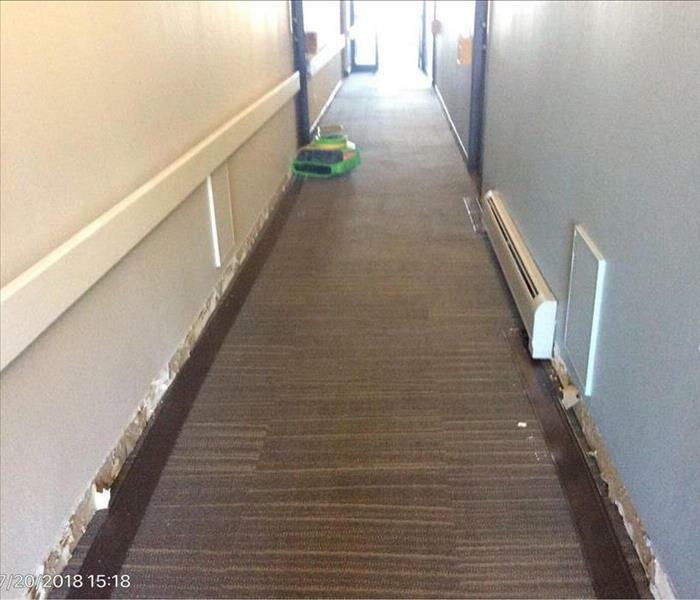 The heating unit for this multi-level office building failed, causing the pipes to freeze and burst. 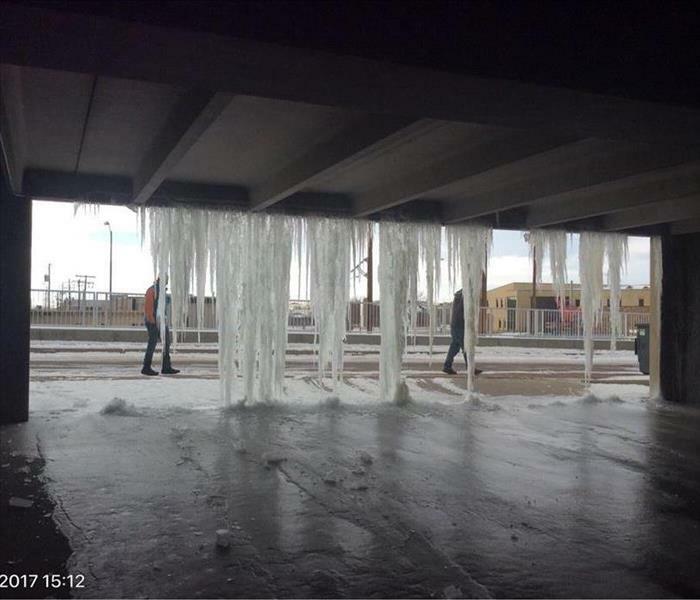 Rising outdoor temperatures took care of the wall of icicles blocking this garage. But extensive work was needed in the office space above the garage to stabilize the property, and prevent further damage. 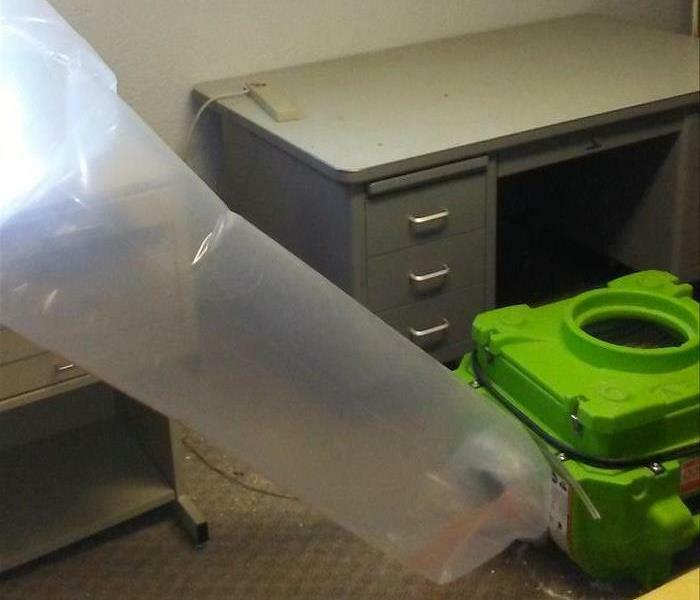 SERVPRO of Casper technicians responded immediately, and dried out the building in a rapid manner. 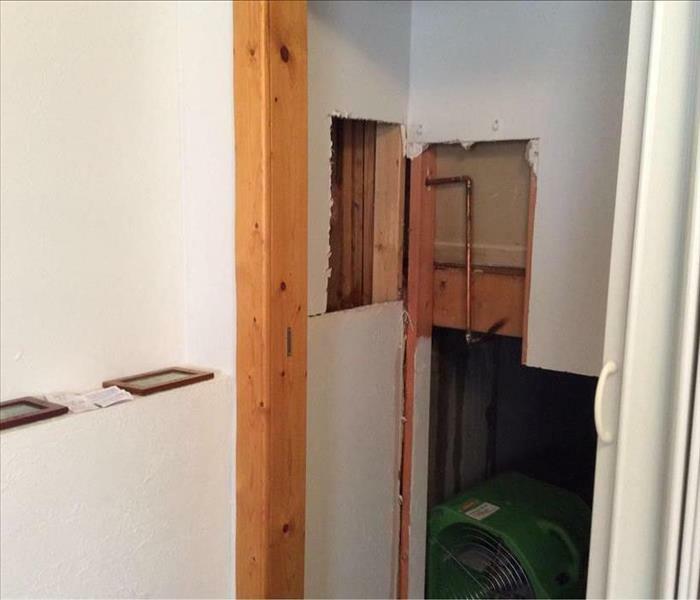 This is a water heater leak that occurred in Casper. Because it wasn’t discovered for an extended period of time, the walls started to grow mold. You always want to make sure you check your water heater and surrounding areas periodically, so you can quickly address any leaks or failures. This kind of microbial growth only takes a little over a week to grow. Water heaters can have a slow leak, and continue to provide normal hot water without any indicator that something is wrong. Because of this, you will never know something is happening until you go into the closet and see the damage. 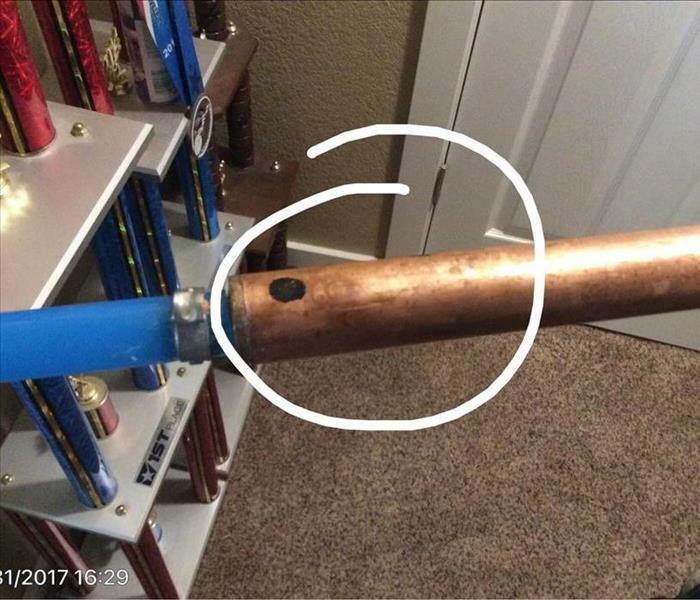 If something like this happens with your water heater, SERVPRO of Casper has trained professionals that can take care of it properly. When customers see how much water is in the basement, or how much is affected they assume that the break is big. But even a small pin size hole can cause a lot of damage in a short amount of time. When most people think of water damage, they think of large pipe breaks and massive flooding. But even a leak the size of a pin can cause a lot of hidden damage. Whether it's your entire basement, or just a wet spot on a wall or ceiling, call the professionals at SERVPRO of Casper. 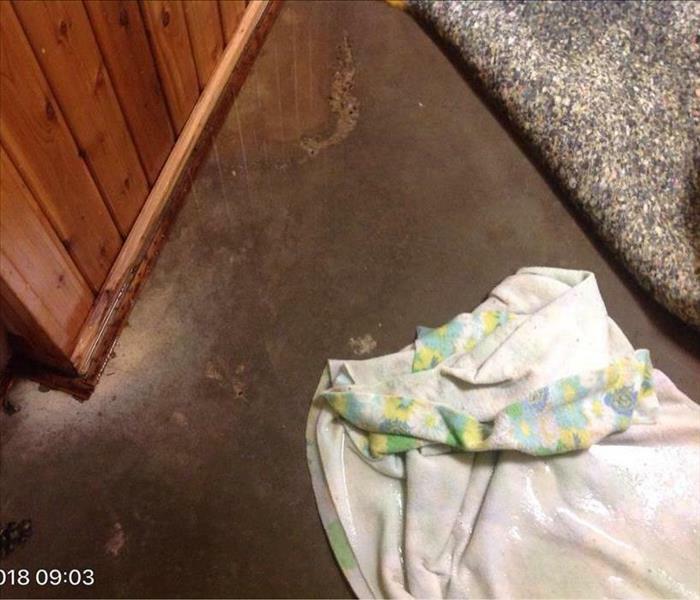 We have the experience and the team to make your water damage "Like it never even happened." Customer had a leaky pipe in the bathroom upstairs. As this was an older house, most of the walls were made of plaster. We did struggle a little to get the ceiling dry and had to remove a portion of the ceiling, but we installed a plastic tent and attached some lay flat ducting to it. With this, we were able to inject the hot, dry air from the dehumidifier into the tent to speed the drying of the area. When it comes to mold remediation, there are multiple steps that are important. Containment must be set up to prevent the spread of mold spores and mycotoxins. Negative air pressure with HEPA filtration must be established in the containment to further prevent cross-contamination unaffected materials and contents must be removed from the area. It's very easy for mold spores to spread and cause damage in additional areas, so when there is a mold problem, it is important to call the professionals at SERVPRO of Casper right away. 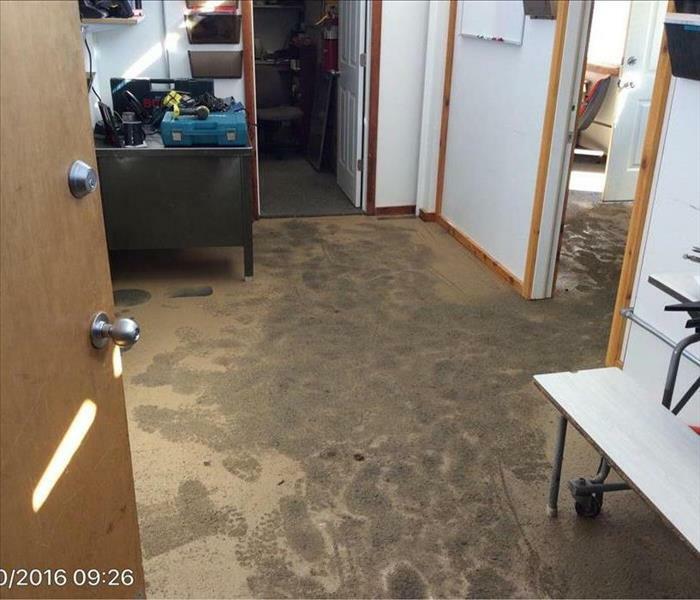 Commercial water damage happened at a ski lodge in Casper WY. The contractor that was working outside created a mudslide. It ended up running into the building, which caused a muddy mess. SERVPRO of Casper was called in to do the cleanup and to dry out the structure. 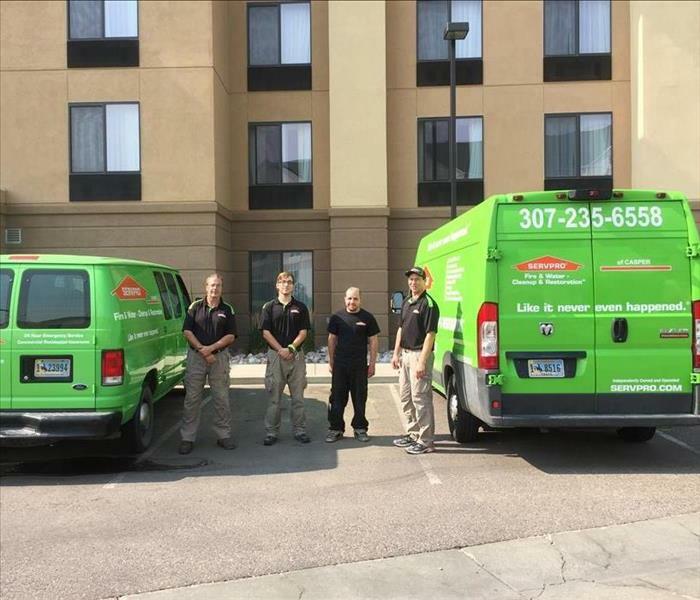 SERVPRO of Casper's number one priority is safety, the customers' as well as our employees. When we go into jobs that have contaminants, we want to make sure that our employees are wearing the appropriate Personal Protective Equipment (PPE). The customer has a Summer home that he goes to in the cold months. This Winter was colder than normal. 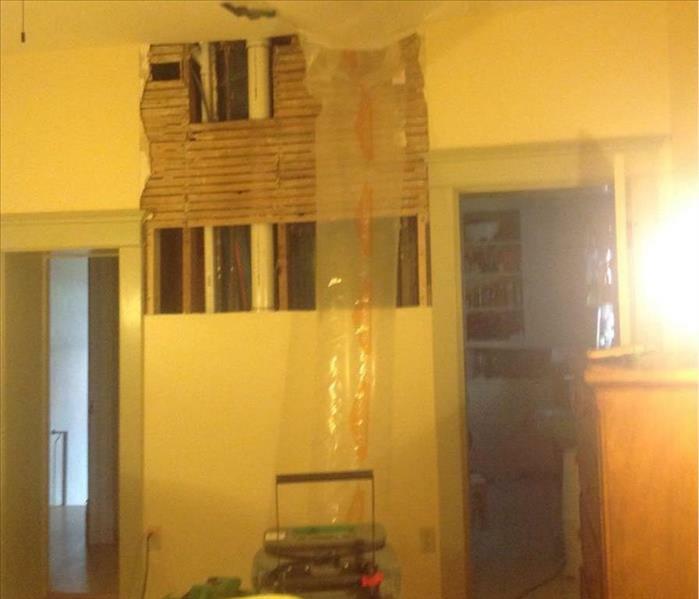 The heating system failed, and a water line broke in the ceiling as a result. The home filled with water, which froze and created a sheet of ice on all of the floors. 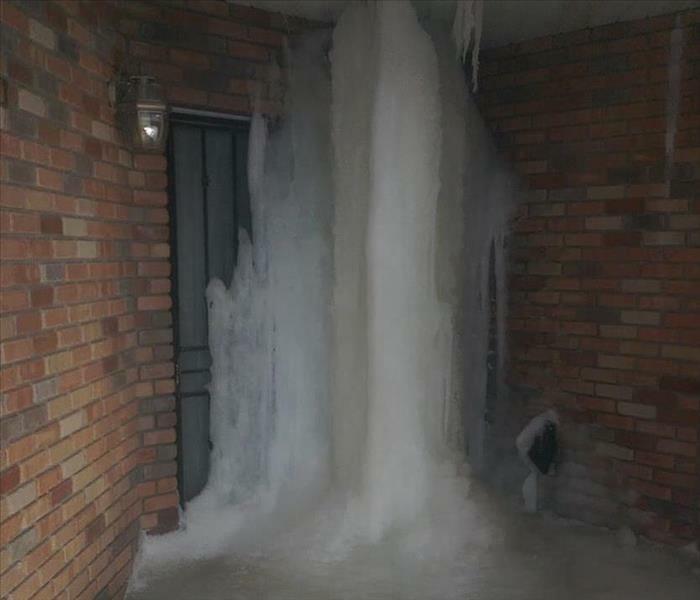 Some of the water inside the attic spilled out through the front of the house, causing a huge ice formation at the front door. In order to dry the home, it had to be first thawed out. 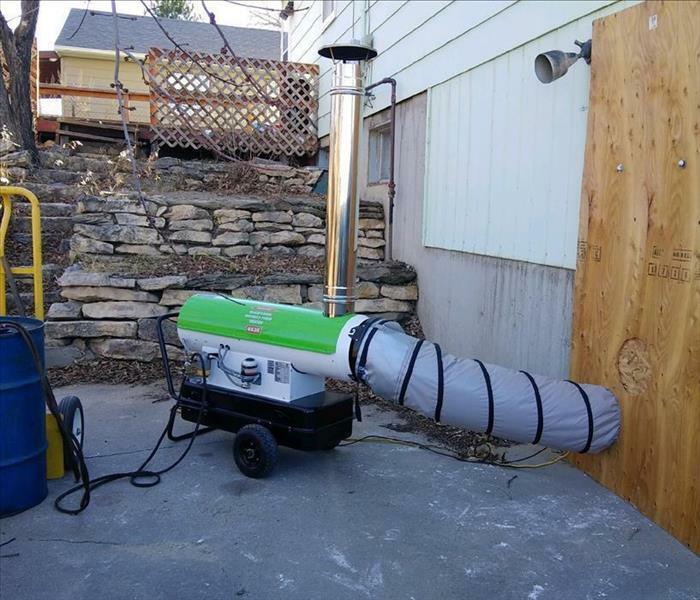 SERVPRO of Casper installed a diesel-fired furnace outside the home, pumping warm air into the structure. As it thawed, we were able to remove the water, and dry the structure out thoroughly. 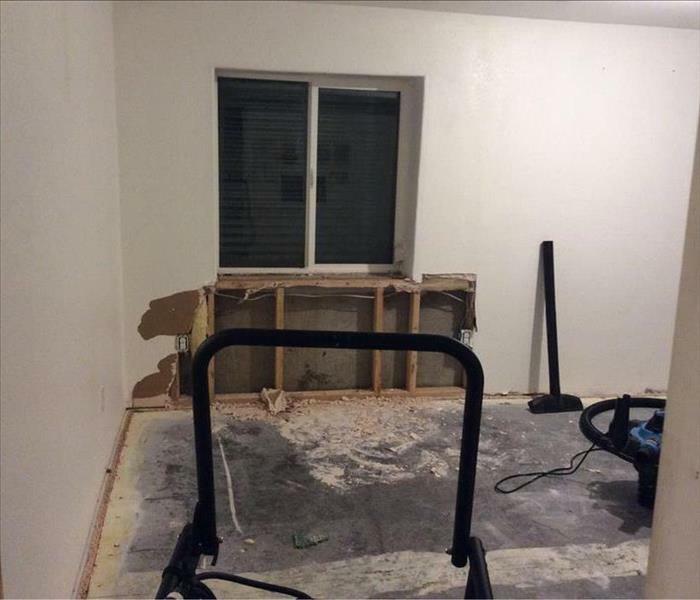 This home was vacant for an extended period of time, and they ended up having a water damage. No one had checked on the house regularly. The high humidity caused condensation on high surfaces in the home, a condition known as secondary damage. 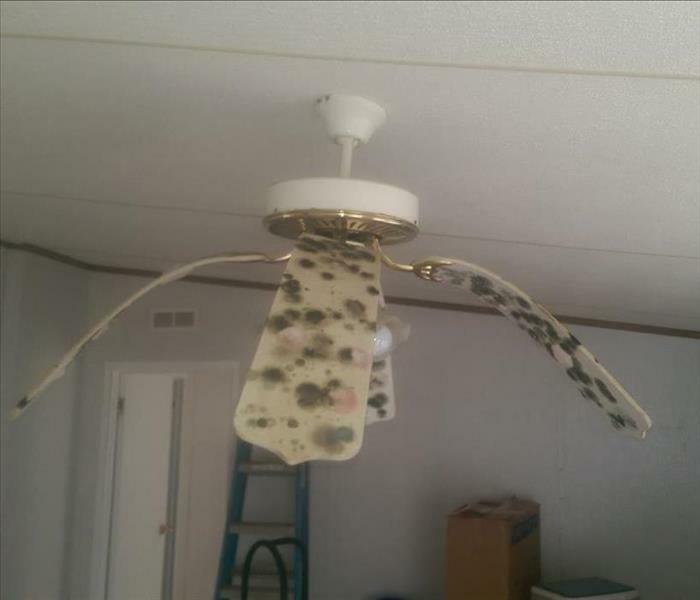 With that, wilting and mold growth took over the ceiling fan. SERVPRO of Casper went in and remediated the loss and brought the structure back to a safe and livable condition. 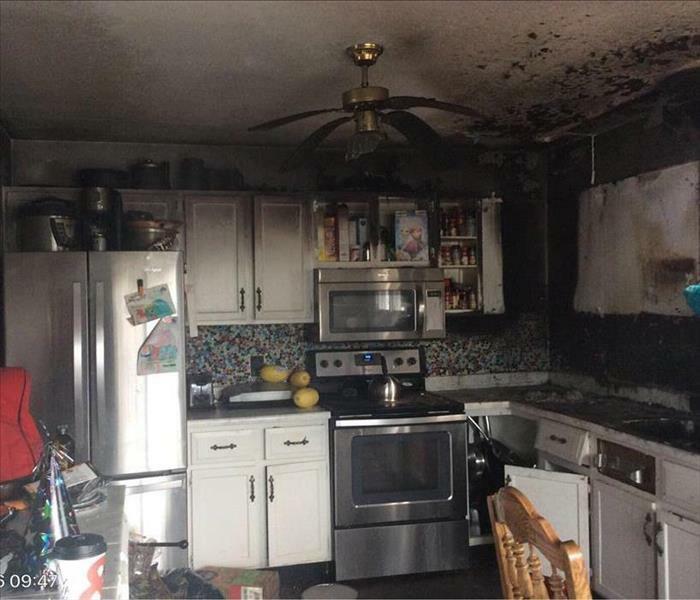 This was a smoke damage from a kitchen fire in Casper, WY. The clean up was very successful, with the exception of the burnt areas, which were removed and replaced by a local contractor. 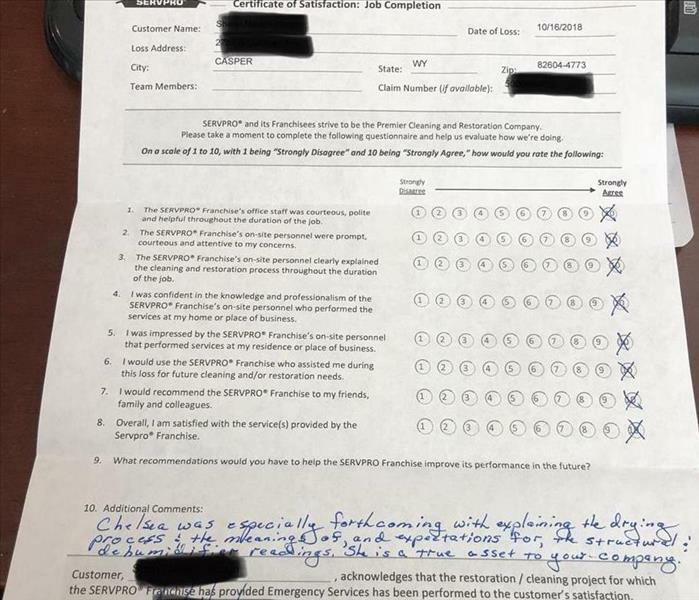 The customer was very satisfied with our work. 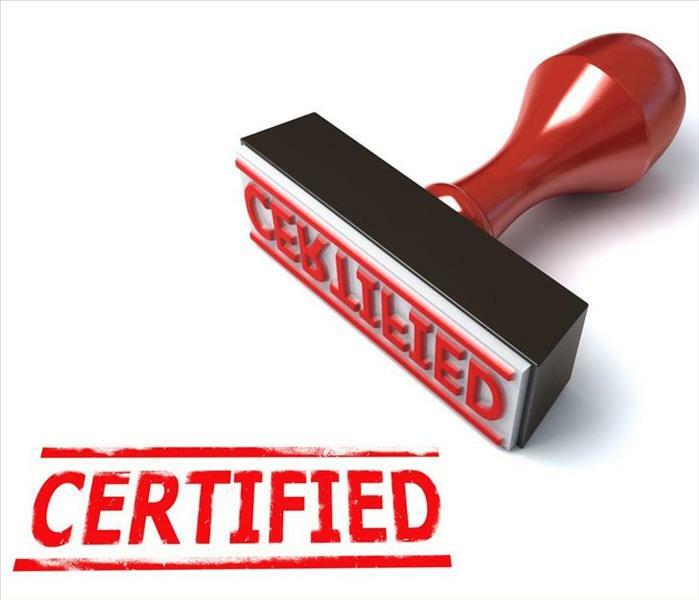 A huge benefit you get of having SERVPRO of Casper clean up a smoke damage is that the supervisors are IICRC Certified.